paneer recipes | Indian paneer recipes. Paneer is a type of fresh cheese that is believed to have originated in the Indian sub-continent. Also known as cottage cheese, it is used widely in Indian, oriental, continental, Persian and other cuisines. Its captivating succulence, soothingly fresh taste, and versatile absorption of flavors make it a brilliant addition to any recipe. Be it a soft milky dessert, a refreshing salad, a flavorful subzi, pulao, roti or any other paneer creation, the secret of its success can be attributed to the quality of the paneer used. For this reason many people prefer to make their own paneer at home, even though it is readily available in supermarkets under varied brands. Homemade paneer is also easy to make, so why not give it a try? 2. While it is still boiling, add some lemon juice to it gradually. 3. Turn off the flame and wait for a few minutes. You will see the milk curdling. 4. Once the milk has curdled, strain out the whey water using a muslin cloth. What remains on the cloth is crumbled paneer. 5. If you want solid paneer, place the paneer in the muslin cloth into a 125 mm. (5”) paneer mould or any other mould and press it with a lid. 6. After an hour, you can use the paneer, cubed or grated. 1. Made with Cow’s milk. 1. Make sure you boil the milk well in a big, deep non-stick pan. 2. You must add the lemon juice when the milk is boiling or else it will not curdle well. 3. If you feel the paneer has not curdled sufficiently, turn on the flame and boil the milk for a minute or two more, stirring occasionally. 5. Once curdled, make sure you drain the water completely. You can even tie the paneer in a muslin cloth and hang it up for a little while to let the water drain completely. 6. To make perfect cubes of the paneer, you need the paneer mould or paneer press, which is readily available in all utensil shops. This will help you get a perfect shape and uniform thickness. 7. Always put a weight on the paneer once you have removed the excess water and shaped it using a paneer making vessel. You can use jugs or bowls filled with water to apply the required pressure on the paneer to compress it into a solid. Paneer is good for you When a tasty ingredient is also found to be good for our health, it becomes a doubly delightful, guilt-free treat! Indeed, paneer offers a host of health benefits. 4 reasons why Paneer is good for you? 3. Paneer has loads of Phosphorus, which helps build healthy bones and teeth. 4. It is also a good source of Vitamin A, which is important for healthy vision and cell growth. It is not surprising then that paneer is so widely used in Indian cuisine. It is used to make not just parathas and subzis but also mouth-watering Indian desserts like kheer. It is also a delectable and attractive addition to soups, salads and stir-fries. Use a melon scooper to make round balls of paneer and add it to your salads to make it look tantalizing! In Punjab, where dairy products abound, paneer is used as such or combined with other ingredients to make delicious dishes like Paneer Paratha and Paneer Kulcha. Tongue-tickling Paneer Bhurji and lusciously rich Paneer Makhani are classic and timeless treats that are much-loved dishes in India, and will be enjoyed by many more generations to come! Paneer is one of the richest sources of protein for vegetarians. From crumbled form to cubes/strips, you can use this versatile ingredient to make recipes across all the courses. The best way to kick start your morning is to relish a piping hot paneer paratha with raita and achaar. Another delectable dish is the paneer bhurji which is made by tossing crumbled paneer in easily available ingredients like spices and onion-tomatoes. Apart from this, paneer can be marinated in Indian spices or oriental sauces to make lip-smacking appetizers like paneer tikka, hara tava paneer. You can even coat paneer cubes with besan or papad to make Papad Paneer Fritters, Paneer Pakoda or Paneer Fritters. Crumbled paneer can be used to make innumerable types of stuffings and mixtures that can further be used to make Indian snack recipes like Cabbage and Paneer Rolls, Spicy Paneer Burger or Paneer and Corn Croquettes. North-Indian cuisine makes maximum use of paneer. On a daily basis, they make sumptuous sabzi recipes like Palak Paneer, Paneer Masala, Paneer Makhani, Paneer Makhmali and Paneer Makhanwala. Serve them with tandoori roti / naan and dal-rice to make a filling meal. All this gulped down with a tall glass of lassi will surely make your day! Paneer contains high quality protein and calcium which aids in weight loss. Since paneer is low in carbs and high in protein it gets digested slowly and hence good for diabetes. Great for weight loss and read the interesting article on is paneer good for you? 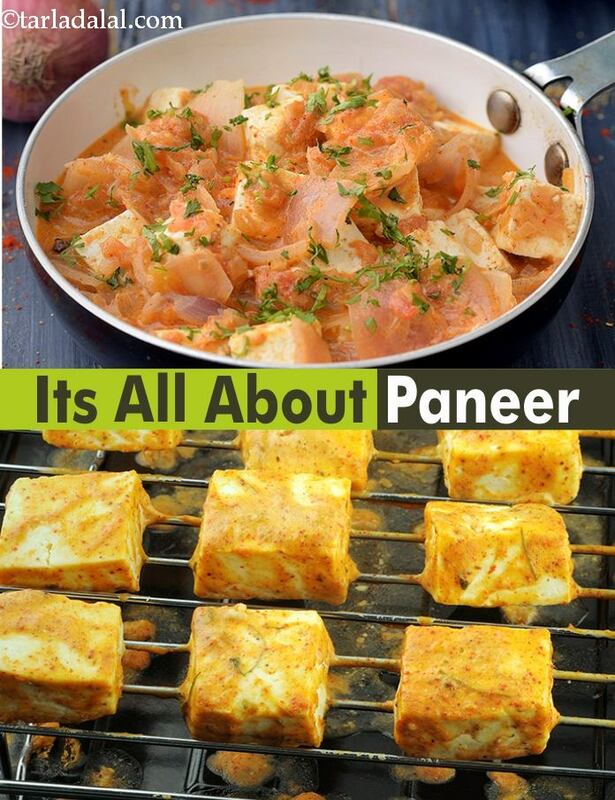 Enjoy our paneer recipes | Indian paneer recipes given below.